Park Shi-hyeon and Olivia Hussey? Are They Kidding? 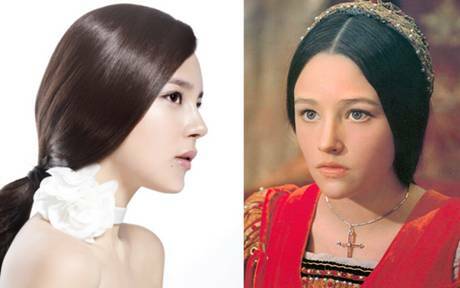 Korean actress Park Shi Yeon transformed herself to Hollywood actress Olivia Hussey. Park Shi Yeon recently had a photo shoot for make-up brand Orbis, and in order to portray a clear and clean image, she transformed into Olivia Hussey for the concept. In case you aren’t aware, Olivia Hussey is a movie star who is most famous for her role as Juliet in the 1968 version of Romeo and Juliet. She is also recognized as one of the most beautiful women in the world. Aside from Park Shi Yeon, SES‘?Eugene is another Korean celebrity who is said to resemble Olivia Hussey.